• Cauliflower pieces - 1 number. • Turmeric - 1/2 tea spoon. • Corn starch - 1 tablespoon. • Curry leaves - 5 bunch. • Green chillies - 3-4 numbers. 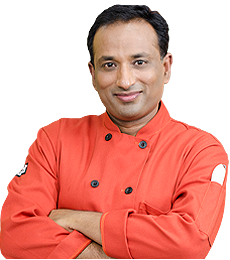 Marinate cauliflower pieces with salt, garam masala, coriander powder, turmeric, chilly powder, corn starch, all purpose flour. Now deep fry the pieces in hot oil and take them out on a tissue paper when they turn golden brown. Also deep fry lot of fresh curry leaves. Now in a hot oil add chopped green chillies and saute it till they become golden brown. Now add deep fried cauliflower pieces, curry leaves, chat masala and mix thoroughly. It’s a simple and quick cauliflower recipe. Cauliflower dipped in all purpose flour and rice flour batter and then deep fried which comes out to a yummy snack. This is tossed with curry leaves, green chillies and chat masala for additional flavor. Cauliflower dipped in all purpose flour and rice flour batter and then deep fried which comes out to a yummy snack. Read More..
Cauliflower dipped in all purpose flour and rice flour batter and then deep fried which comes out to a yummy snack. 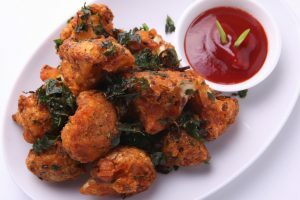 Curry leaf cauliflower fry is a simple, quick yet very flavorful and delicious cauliflower recipe. This fry recipe is made with cauliflower florets that are batter coated, a mix of all-purpose flour, rice flour and salt. The batter coated florets are deep fried until they become crisp and golden brown in color. The deep fried florets are tossed with fried curry leaves, green chillies and sprinkled over with chaat masala which adds in enhancing the flavors. Cauliflower is a seasonal vegetable and is used in making a variety of dishes. You could make some of the most yummy and appetizing starters with cauliflower. They are also used in making a variety of side dish curries or added in main course. Curry leaf cauliflower fry is absolutely delicious to taste, crispy on the outer side and soft and creamy inside. This will surely be the highlight of dishes and should even tempt the pickiest of eaters in your house in grabbing this snack. The subtle flavors of green chillies, curry leaves and chaat masala coated over the deep fried florets will just keep you finger-licking. Marinate the cauliflower florets with salt, garam masala, coriander powder, turmeric, chili powder, corn starch, all-purpose flour. Heat oil in a kadai and deep fry the pieces in hot oil. Take them out on a tissue paper when they turn golden brown in color. Also deep fry lot of fresh curry leaves, chopped green chillies and lightly sauté. Now add deep fried cauliflower pieces, curry leaves, green chillies, chaat masala and mix thoroughly. Cauliflower is low in fat, high in dietary fiber, folate, water and vitamin C, possessing a very high nutritional density. A high intake of cauliflower has been found to reduce the risk of aggressive prostate cancer. Cauliflower is also a good source of carotenoids. Cauliflower can be roasted, boiled, fried, steamed or eaten raw. Steaming or microwaving better preserves anti-cancer compounds than boiling. Low carb dieters can use cauliflower as a reasonable substitute for potatoes au gratin for while they can produce a similar texture, or mouth feel, they lack the starch of potatoes. Curry leaves are commonly known as kadi patta and is a staple herb used in most Indian dishes. It is usually used as seasoning that adds a special earthy flavor to every dish it is added to. Apart from its explicit flavors, this humble curry leaf adds more benefits as the leaves are packed with carbohydrates, fiber, calcium, phosphorous, iron, copper, vitamins etc. It is often said that eating curry leaves help your heart function better, fights infections and can enliven your skin and hair. Curry leaves are potent anti-diabetic agents and has a great impact in lowering the blood sugar levels of diabetics. I will definitely try this tonight? I will definitely try this jimmy recipe? Super saw yesterday night cooking today thanks fr sharing such good dishes.god bless u beta? Hi , I used to watch ur husband's videos nd now I'm trying ur recipes & this was ??? ?mouth watering I loved it... U both are inspiration for cooking keep on going .... Best wishes ???????? ?